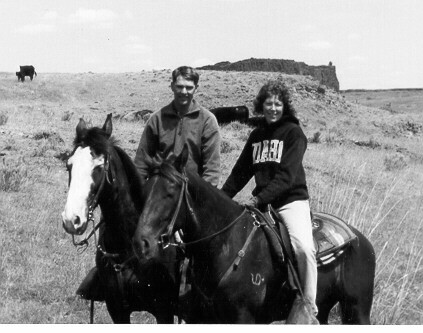 Dunfur Kennel is located near Spokane, Washington and is owned and operated by Dan and Renee Hoke. Dan and Renee have been committed to producing top quality hunting dogs, as well as nationally competitive field trial dogs over the past 20 years. Dan's time, dedication, and genuine love for dogs enables Dunfur Kennel to consistently produce top quality dogs year after year. Dan is also a field trial judge on both the regional and national level and knows what it takes for a dog to become a national champion. 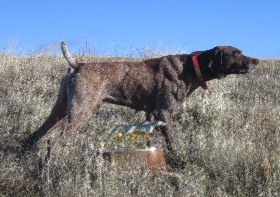 Dan is also a member of the Spokane Bird Dog Association and has been chairman of the Inland Empire GSP club for several years. 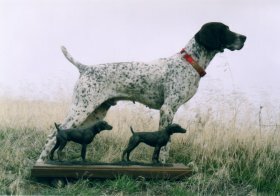 He has been very involved in exposing our younger generation to the enjoyment of bird dogs. It is through free training days and clinics for the kids that many youngsters experience the excitment of watching an excellent bird dog work for the first time. Dan continues his involvment with the kids by volunteering to teach the local hunter safety course. 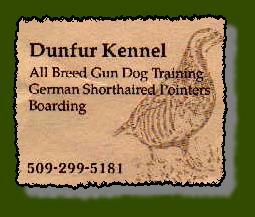 Dunfur Kennel offers a wide variety of services including gun dog, obedience, and field trial training. Boarding and stud services are also available.